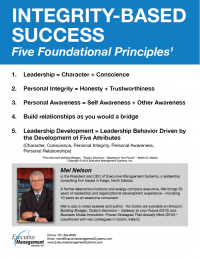 Mel believes that the most powerful, unswerving core business leadership principle is a commitment to truth. This includes congruence in all spheres of one’s life – a profound consistency of the whole person…in one’s public and private life; manifested in leadership, relationships and business success. As a CEO who develops CEOs, Mel works with business leaders to discover, understand and speak truth as a powerful, too oft-neglected leadership skill. Working with CEOs and senior leadership, Mel shines the light of truth on business situations to identify and eliminate blind spots. This time-tested approach build effective leadership teams, deep relationships, vibrant cultures and brings strong results to the bottom line. 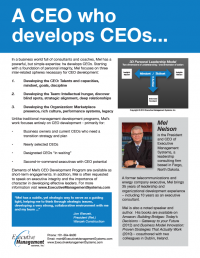 Developing the CEO: Talents and capacities, mindset, goals, discipline and more. 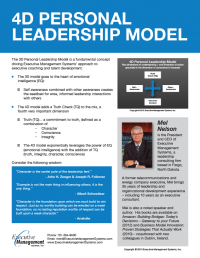 Developing the Team: Intellectual hunger, discover blind spots, strategic alignment, deep relationships and more. 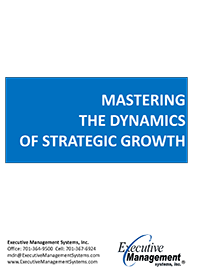 Developing the Organization: Market presence, rich culture that attracts and retains talent, performance systems, legacy and more. Mel creates a “safe zone” by building trust – a zone where business owners, CEOs and executive teams can have conversations and bare their souls with no feat of recrimination, judgment, criticism, politics, or leakage. To request an initial conversation with Mel, click here.